This is how today started…no less than eight phone calls were made in relation to my son Devon. I talked with the supply company (twice), the GI office (twice), the pediatrician, the geneticist, the director of special education services for our school district, and Devon’s service coordinator. When I got done with all that, my husband tried to lighten the mood by saying, "Gee, you would think this kid had a disability or something!" Yeah, you would…or would you? Looking at Devon, and especially being touched by his joyful spirit, the last thing that enters your mind is "disability." We are happy for that, and it is as it should be. What perhaps is not so obvious, however, is how much time and effort goes into assuring that is the case. Or how much fear we either push aside or work through to make it happen. I don’t assume Devon will be with us in the future. "Assume" being a key word in that sentence. I don’t necessarily think he won’t be, but I take nothing for granted. I recognize that that is not a normal way to live, and that it actually could have harmful repercussions. But then I have to cut myself some slack. My life experience has taught me at a young age that it would be foolish to take for granted the life of either of my children. After attending the funerals of my sister and two young cousins, who would make any assumptions about life? Add to those life lessons a little boy who has multiple medical and developmental issues and it is no wonder I feel as I do. I suspect there are some who think me a bit crazy, or perhaps a bit too wrapped up in all the medical drama. Sometimes that comes from well-meaning strangers or acquaintances ("Oh, he’ll have a growth spurt…all boys do"), and sometimes it comes from family and dear friends, particularly those who don’t acknowledge what we face. The people who never ask how Devon is. I must tell you that while dealing with well-meaning strangers can be frustrating, dealing with family and friends can be very painful. I probably am a bit crazy, but I don’t think I could live with myself any other way. I recently met the director of our local Make-A-Wish chapter at a work function. We were talking casually about Devon and she asked me if he has had a wish. It took my breath away. It is bothering me days later, because it made me see things in a new perspective. You see, it just isn’t normal to not be growing, it just isn’t normal to not be able to swallow correctly at nine years old, it just isn’t normal to have low bone density, to require a feeding tube, and be hoping to have a fifth grade reading level when you leave high school. There are lots of things that are just not normal, but at the risk of being viewed as obsessed, I’ll stop here with the things most on my mind right now. I told the lovely woman from Make-A-Wish that my fondest wish would be to know what we are dealing with. You see, I can’t flat out say, "No, Devon wouldn’t be eligible for a wish…what he has is not life threatening," because the bottom line is that we just don’t know. And the doctors don’t know. We just don’t know and we don’t seem to be getting any closer to figuring it out. What we do know is that Devon has an undiagnosed genetic syndrome…we have been assured of that. Lately, whenever we are at a doctor’s office, I will hear some version of the following: "Well, we really need to know what syndrome he has in order to XXXXX." The XXs could be, "predict his prognosis," but most frustrating to me is when the XXs are a decision as to what the next best step is. That is the part that keeps me awake at night. Over the last year I tried really hard to follow the advice I have often received to live for today, enjoy Devon, and let the worry go. If you have given me that advice, not to worry…I understand where it comes from and it is good sound advice. A person can’t live in a state of heightened alert forever. I probably needed to take a break, catch my breath, and just relax and enjoy for a while. But right now, it doesn’t feel like that is working anymore. I learned yesterday that a window of opportunity to treat Devon’s short stature with growth hormone has closed. At the suggestion of Devon's GI doctor, we started talking to an endocrinologist about this a full year ago. She explained growth hormone is contra-indicated in some syndromes. And then she used the word: "Devon is undiagnosed, so I am not comfortable prescribing growth hormone for him at this time." I didn’t push it. I decided to relax and let the doctors do their job. Electing to follow her wait and see approach, I came back with Devon in a year. Well, that year was a big mistake, as Devon’s bone age has caught up to his chronological age, and the growth hormone will no longer be as effective, if effective at all. She had told me a year ago that if I really wanted to pursue it, she would order some more testing. But I didn’t want to seem like a parent fascinated by medical treatments, a parent who wants to put her child through tests, give him shots every night and take chances, so I let it go. I have been so upset with myself since we got the bone age results. The irony is that the report reads that Devon no longer has a delayed bone age. Isn’t it a mixed up world when a "normal" report spells bad news? I feel like a normal report always spells bad news; in the world of genetics we must find what is not normal to nail down a diagnosis. No doubt it is good to rule out certain genetic conditions, but whatever Devon has is already at work and we really need that diagnosis to help us make decisions. This is the perplexing dichotomy parents of undiagnosed children are expected to navigate with grace. Despite the fact that much around you is amiss, you have to accept that testing shows everything to be just fine. Let that dichotomy throw you off balance and others may begin to think there is something wrong with you. And then there is another question the endocrinologist asked me (twice): "Does the geneticist think that Devon will need assisted living as an adult? If so, we don’t think it is good to help him grow larger…it would be more difficult for the people lifting and transferring him." How am I supposed to hear that and not become a bit unglued? This is why I can’t live with myself any other way. I need to know that I have always done all that I can to assure that we find out what we are dealing with so that other windows of opportunity don’t close, some of which could be much more important than how tall Devon will be. I don’t think that is so crazy after all. The woman from Make-A-Wish approached me at the end of the day we spent together. She gave me a bright, shiny Make-A-Wish star complete with sparkles to put on my car. She told me to think about what we had talked about and give her a call. I hung that star in my office today where I can look over and see it from time to time. For right now, I’ll use it to remind myself of My Wish, that we will one day know exactly what we are dealing with. I hope that I’ll be able to call up my new Make-A-Wish friend and tell her, "Thank you, but Devon won’t be needing a wish after all…they have all come true!" 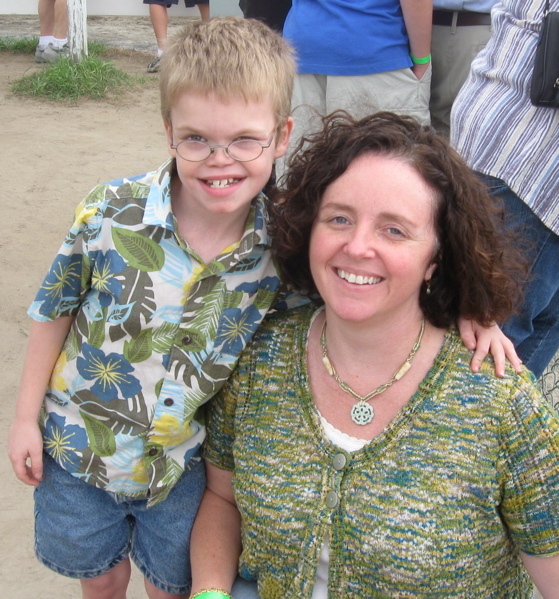 Michele has previously written about her family's experience in having an undiagnosed child. The current article, adapted from a journal entry during the summer of 2010, updates their journey. Like any journal entry, it captures a moment in time and the concerns of the day. Michele and her family are grateful for all of those who walk this path with them or stop on the road to offer support and a listening ear. Her hope is that all families on a similar path will feel understood. Michele is employed as Project Director of New York State’s Family to Family Health Information and Education Center. The FHIC exists to connect, support, and empower families who are raising children with special health care needs. Michele can be reached at (518) 381-4350 or f2fhealthtools@verizon.net.